Nowa Huta tour - Polish Tours & Travel Agency - Greetings from Poland! Nowa Huta Tour gives you a unique chance to see the town built by communists after the Second World War, mainly to destroy aristocratic and intellectual character and traditions of Krakow, by erecting a huge “Lenin” Steelworks with its “healthy working class” neighborhood. 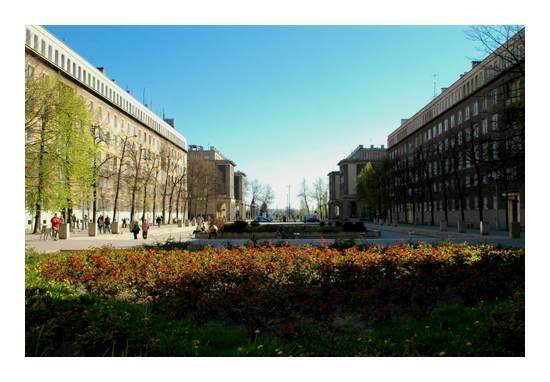 The tour starts in Central Square, in the very heart of Nowa Huta, near which an enormous statue of the city’s patron, Lenin, used to stand for years. Afterwards, the tour continues to the Steelworks, now owned by the “Mittal Steel” Company. Its gates are closed for visitors, but we will be still able to admire its size and learn about its history. After that we will pay a visit to the Museum of Nowa Huta, which holds exhibitions dedicated to the history and tradition of the city. After that we will see the Nowa Huta Cross, which symbolizes the bloody fights for the establishment of a church in the town. Later we will visit “the Lord’s Ark Church”. The final stop of our tour is the Monument Commemorating the Site of Bogdan Wlosik’s Death, which is dedicated to all victims of Martial Law, imposed in Poland in 1981. Our journey into the past ends in a typical communist era bar, where over a glass of communist times booze you will find out more about the absurdities of life under the communist rule. The Nowa Huta tour lasts approx 4 hours. Price includes: English speaking guide, hotel pick up from selected hotels, admission to the museum, a drink in Stylowa Restaurant (Avenue of Roses). Additional information: minimum number of participants – 2 persons.